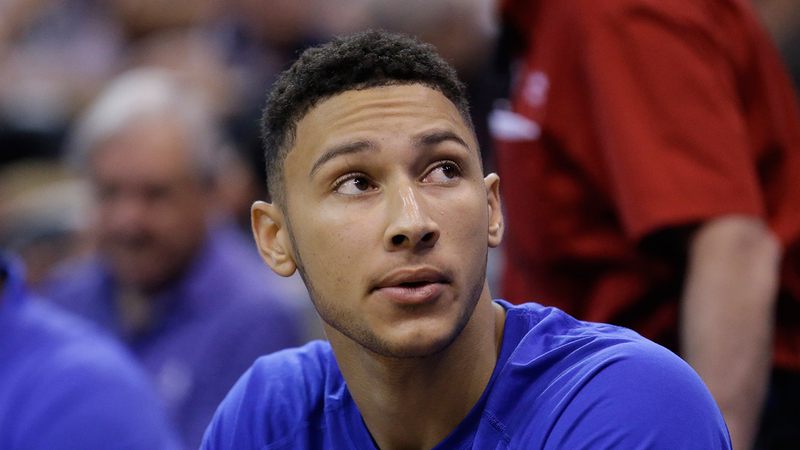 PHILADELPHIA -- Ben Simmons won't make his NBA debut this season. His surgically repaired right foot hasn't healed sufficiently for the No. 1 overall pick to play in the final 26 games, the team said Friday. Simmons fractured the fifth metatarsal bone during the final training camp scrimmage in October and hasn't played a game. A CT scan Thursday revealed his foot hasn't fully healed. "Unfortunately, Ben is going to sit out. That's the bad news. The good news is one day he'll put on a uniform," 76ers President Bryan Colangelo said. "It's not the way you want to start your career, but it happens. We're not excited about the news today. Ben is heartbroken." The 6-foot-10, 250-pound Australian was Philadelphia's first No. 1 overall pick since Allen Iverson in 1996. Simmons was going to play point-forward. "Nothing has changed with the plan and the vision," Colangelo said. "The plan is to build and sustain a successful basketball program." Colangelo also said star center Joel Embiid will miss at least four games because of a bruised left knee that has sidelined him for 11 of the last 12 games. "All signs are he is progressing well," Colangelo said. Embiid, the No. 3 overall pick in 2014, missed the first two seasons while recovering from foot surgery. The team traded big man Nerlens Noel, the sixth overall pick in 2013, to Dallas on Thursday for veteran center Andrew Bogut, young swingman Justin Anderson and a top-18 protected first-round draft pick. On Wednesday, the Sixers traded forward Ersan Ilyasova to Atlanta. Center Jahlil Okafor, the No. 3 pick in 2015, is still around, even though he was mentioned in trade speculation and hasn't played much because of Embiid's emergence. "The market for (Okafor) was much more broad, but the right deal did not present itself," Colangelo said. Noel will be a restricted free agent after this season, a major factor in his trade and the reason why the return wasn't near his value. "I've often said I won't make a bad deal," Colangelo said. "Yesterday, I made the best deal I could and it was the right move for this organization." The rebuilding Sixers have already doubled last year's win total. They're 21-35 entering Friday night's game against Washington. "As we move forward, there's a lot of brightness on the horizon," Colangelo said. "We feel like we've taken a massive stride forward."